One other drawback to free range feeding i forgot to mention yesterday is that crickets are going to munch on your live plants a bit. It’s not bad when they are adults because your only letting a handful loose every other day and are almost always gone within an hour. It’s worse when they are young because they should have access to feeders nearly 24/7. In my case that means having a large volume of small plant munchers in my viv almost of the time and when you add them all up they can definitely do some damage. I like the idea of free range feeding but then it's a mystery about how much he's actually eating. I came home today and hand fed him 10 or so NutriGrubs, which he loves. This morning I dropped around 10 dubia's and 5 crickets into his cage as I was leaving for work, I spoted 4 or so dubias in a bottom corner. I have holes drilled in the bottom panel for drainage, I may install a screen on the bottom side. The holes are only 1/4" so only very small ones can slip through. He looks so skinny sometimes, is this normal? Curious about what my guy is going to look like, he isn't showing coloration anything close to what his dad looks like. Do you guys think I will see changes within 1-2 months? Also, is definitely a male? I included a picture of dad. I read that but saw some pictures of some aged around the same that show much more, I guess it varies. The last 2 days have been great from an eating perspective, he has an appetite and I have been hand feeding him dubia roaches, nutrigrubs, crickets, and mealworms. I threw 5 roaches and 5 crickets in the bottom of his cage this morning but have no idea if he saw them or where they ended up, I'm on the fence about the free range feeding thing. This weekend I'd like to seal the bottom tray with hot glue and cover the bottom tray holes with screen but I don't want to stress him out by handling/taking him out. He is getting comfortable with my hand, I think the hand feeding is helping with that. I just ordered 200 dubia roaches and some hornworms. I'm wondering if crickets will do better for free-range eating if I threw them in the plant instead of the bottom -- I was hoping they would climb up the screen and get spotted and eaten. I think the dubia roaches will just cluster in a corner or a plant and never move or be seen and eventually die. He's funny, with the cham cam I can see that he consistently starts roaming around at 12:30-1pm. He has been going to bed in the same exact spot in the umbrella plant at around 7pm. He has a schedule. Not many people free range Dubia for the reasons you mentioned, hand or cup feed only. Any feeder that naturally wants to hide isn’t a good free range option. I stick to crickets, Katydids, grass hoppers, BSFs, dragonflies, and moths. Sounds good, maybe I'll leave dubias in the feeder thing I made and throw crickets into the plants. I haven't seen him acknowledge this thing yet, maybe i need to put it in a different spot. I am going to hot glue the outside edges of the screen, i found they were sneaking under. Someone discovered his feeder! This makes feeding so much easier and I can see how much he eats and allows him to eat when he first wakes up instead of my hand feedings at 6pm. I put around 10 dubias, 5 mealies and a bunch of nutrigrubs in and he went to town. Should I limit how much I put in there, or feed as much as he will eat? @RyanBRZ I've always free-range fed at least half the feeders I'm giving my cham, but I make sure to be selective like everyone has described. In other words, I'll easily let crickets free-range in the cage and my cham loves to hunt them! 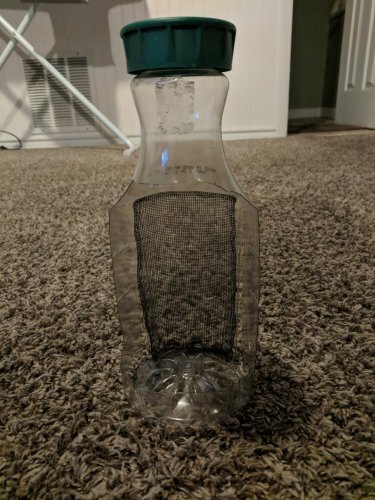 I have a feeder cup very similar to yours and that's where I make sure to put all the other feeders (roaches, worms, etc.) because they hang out at the bottom, fall to the bottom, etc. and then my cham ignores them or they fall through my drainage holes. 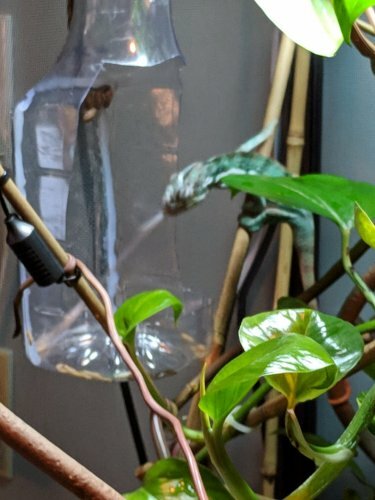 My crickets will sometimes get through my drainage holes (rare), but they fall to their death into the drainage water and drown, so it's really just a small waste of money to me, but like I said, it's rare for my setup. Based on my experience in "dumping" crickets in a free-range way, you're going to get the calcium powder (and other supplement powders) all over your enclosure if you don't think about it first. I learned this the hard way and ended up cleaning up a big mess, haha. I use a mason jar for dusting my crickets (a lot of people use a bag or an old peanut butter jar or something idk), and first I just make sure there isn't a huge amount of the supplements in the jar, put my feeders in, shake it around a little, and I'll tilt the jar horizontal in the enclosure and allow the crickets to crawl out and onto the vines and branches naturally. This avoids spilling the powder everywhere AND the other feeders (worms, roaches, etc.) tend to not be as active and ready to crawl out, so they're usually last and I shake them out last into that DIY feeder cup which will catch any of the powder that escapes my jar. Every 2 weeks or so I clean out the feeder cup really well with an old toothbrush and a diluted vinegar solution because it gets grimy. Eventually I'll probably need to start fresh and make a new one, but honestly it's held up really well with me just keeping it clean. When mine was 3-4 months old he would eat 18-20 small crickets in 5 minutes. It blew my mind away and I thought I might be over-feeding my little guy, but looking back I wouldn't change the amount. I would have been better about the variety from the beginning, but you're already doing that! You don't have to worry about cutting back until he's about 7ishhhh months old, emphasis on the ish because I've read a lot of different opinions on the timing of this actually. The one common trend is that you want to gradually taper the amount you give them or they'll get grumpy (hell, I would too!). A very established member told me to cut back 2 crickets every 2 weeks until I got to a better number. OH another pro-tip for the morning routine and lights. My lights are 7:30-7:30 but sometimes I have to wake up earlier than they turn on and I have to get ready in the dark (my setup is also in my bedroom). I use a headlamp or flashlights. I'll even plan my outfit the night before, or do whatever I need to in that room the night before, to spare my cham! Anyone watching me would think I'm nuts, but if you turn on over head lights or even just one lamp (even a low/dim lamp) it could wake your cham early and he won't be getting his rest. The reason I have the headlamp is for the feeding. Your cham does need the food for the first half of the day to properly digest. It's better to put all of his feeders in the feeder cup while he's still asleep and then you leave for the day, then to feed him too late in the day. I've done this on those days I have to leave super early in the morning. Hence the headlamp! That way I can work with my hands and prepare everything, open the enclosure, dump feeders in his cup, close it up, and know that my little guy wakes up with a pleasant surprise lol. SORRY I KNOW TOO LONG. Nobody will believe me, but I try to be concise. It's all for the love of chameleons! I am trying to move away from crickets and stick to dubia roaches, nutrigrubs/phoenix worms/calciworms, meal worms, hornworms, superworms, and silk worms. My plan is to stick to the feeder cup because I like being able to see what he is eating each day. Last night I covered all drainage holes with pieces of screen on the bottom-side with hot glue to prevent stuff from falling through. I also did a full cleaning last night and found a bunch of worms, crickets, and roaches that managed to squeeze through the drainage holes or between the frame and the bottom vinyl piece which was bowed up from the weight of my umbrella plant -- which I secured by placing a piece of rock on each side. For now I am using a bag or a smaller sized Solo® cup for dusting and then I dump everything into the feeder when I leave for work at 7am. I check on him around 30-45 mins after lights go on and he is there chowing down. Trying to avoid having stuff roam freely, and avoid crickets all together. I've been giving him around 6 meal worms, 6-10 nutrigrubs, and 10 x mixture of roaches/crickets. All is gone when I get home from work, except for maybe 1 or 2 of said items. I just got 200 dubias and 15 hornworms in the mail today from dubiaroaches.com, so he will be getting a treat tomorrow since he's never had hornworms. I am hoping he enjoys dubia's because they seem like the easiest from a maintenance, annoyance, and health perspective. I've been getting up in the dark to avoid waking him up, I actually switched to a 7am-7pm light schedule this week but I found that he has been going to bed by 5pm so I am going to go back to 11am-11pm so I can at least see him when I get home from work. Regarding eating during the day, the cup works perfectly for this, I see him eat and then he basks for a few hours and then moves under the UVB. He is staying hydrated and is looking good, I think his cage setup is working nicely. Thanks everyone! Based on what I read, Repashy has everything--dust every day and you're covered from a vitamin/calcium perspective. Welcome, and good luck! It is exciting to do the research and build anticipation. I'm fairly new to chameleon keeping, and like you, had quite a bit of prior reptile experience. I have a female panther chameleon I bought from Nick at Canvas Chameleons. She was about 7 months when I got her and is doing great. I suggest you read up a little more in the forums on calcium dusting and supplementation. Many use Repashy with D3 every two weeks, vitamin supplement (like Reptivite) every two weeks, and daily dusting with calcium only (like RepCal with no D3). Some feel dusting with Repashy with D3 daily is overdosing. Also make sure you have a light that emits UVB - many like the Arcadia 6.0 HO T5 along with an HO T5 daylight bulb. For basking, I would use an incandescent bulb, not a ceramic heat emitter. Cooler night temperatures are okay. 12 hour photoperiod. For cage, even if you can't afford one now, look into Dragon Strand, which are beautifully designed. Check out the Dragon Strand medium Atrium for a panther male or female. I have my chameleon cage over a standing planter box, so my female has almost 12" of substrate to dig in once ready to lay eggs. I'm assuming you only read my first post or skimmed.. I have a reptisun T5 tube bulb, an incandescent basking bulb set to ~83 (decided to not go with the CHE but I cannot edit my original post), 12 hr on/off light schedule, Repashy calcium plus LoD which i read is ok for daily dusting. 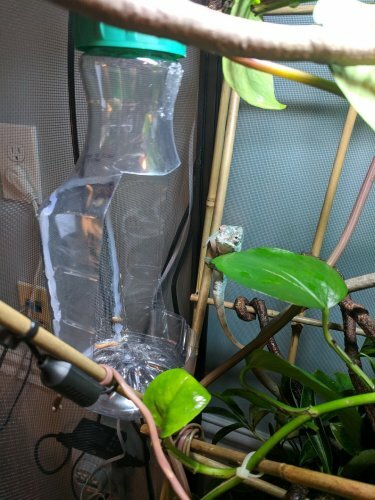 My cage, reptibreeze XL is up and running with 2 pothos and 1 umbrella plant with a mist king mister. Cham is eating like a pig, hydated, and doing great. It would be cool to breed these, maybe one day when i have more experience, and time. Also, your cham is going to love the hornworms, and silkworms, too (hopefully!)! Butterworms are also good! Thanks Erkle, but crap lol, i thought dubias were an accepted form of staple. I thought about subbing out mealies for small superworms, ill have to get some. I did read about issues where nutrigrubs get passed in some cases whole, so i will try to use those on occassion only. I will keep crickets in the mix but not daily. There should be no one staple, if you have three or four you rotate through (for me, that’s red runner, orange-headed, and ivory-headed roaches, and silkworms), or always feed a variety (which it sounds like you’re already doing), you’ll be fine. You’re doing a great job! It’s always hard not to second guess yourself when it comes to your cham! I agree with that, but what I mean by staple is something he gets every day, but not just that, in addition he will get varied items. For example, give him X dubia's every day, and mix in the additional varied items. Today he got 10-12 dubias, 7-8 nutrigrubs, and 4-5 meal worms. When I get home from work I am giving him 1-2 hornworms. Once I get some superworms he will get dubia's, some superworms, and whatever else I have at the time. I need to find silkworms and butterworms. I try to order in bulk because shipping from dubiaroaches.com is getting costly once a week, hence I just got 200 dubias and 15 hornworms. I am going to try a local mom and pop pet store to see what they have in stock. I agree with that, but what I mean by staple is something he gets every day, in addition to the variation items. For example, give him X dubia's every day, and mix in the additional varied items. Today he got 10-12 dubias, 7-8 nutrigrubs, and 4-5 meal worms. When I get home from work I am giving him 1-2 hornworms. Once I get some superworms he will get dubia's, some superworms, and whatever else I have at the time. I need to find silkworms and butterworms. I try to order in bulk because shipping from dubiaroaches.com is getting costly once a week, hence I just got 200 dubias and 15 hornworms. I am going to try a local mom and pop pet store to see what they have in stock. Fishing shops. Amazon, eBay, and dubiaroaches.com all have butterworms, just to name a few. There are currently no silkworms but eggs are availabe, and they’re the same price for like 100-250 eggs as 25 silkworms are.